hey lovely people of the world. We’re back!! Yeah yeah… We’re very unstable.. We’re sorry.. But we’re THREE whole years now…yay? (We’re still receiving gifts, incase you’re wondering ) . We’ll be more ‘grownup’ lol. When last did you dress up to go watch other people strut the runway dressed up by others?! Ding!!!! 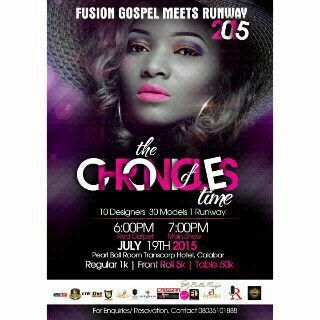 ROD AND STAFF PRESENTS :Fusion Gospel Meets Runway 2015: THE CHRONICLES OF TIME is 18days away! Best dressed on the red carpet will get Instagram mentions.. It’d be so much fun. Always is! Don’t forget to tell your seat partner about it. This entry was posted in ...Inspired, Ads, events, events, activities, Ourblog stuff and tagged Calabar, calabar events, Comedy, dance, Entertainment, events., fashion nights, fashion show, fusion gospel meets runway, july, leisure, music, ourblogazine, rod and staff, Transcorp hotels. Bookmark the permalink.